This September this site will have been operational for six years. I’ve never asked for money, put up ads, sponsorships, etc to help run the site, but today is that day. If you enjoy the nice photographs that we post of food, restaurants, and (especially) concerts, now’s the time to pitch in and help out. Unfortunately the main lens that I use to shoot concerts suffered a fall on the way to an event and when I sent it in for repairs, was told it is unrepairable due to it being a discontinued model. A replacement is extremely expensive, and that’s where I need your help. 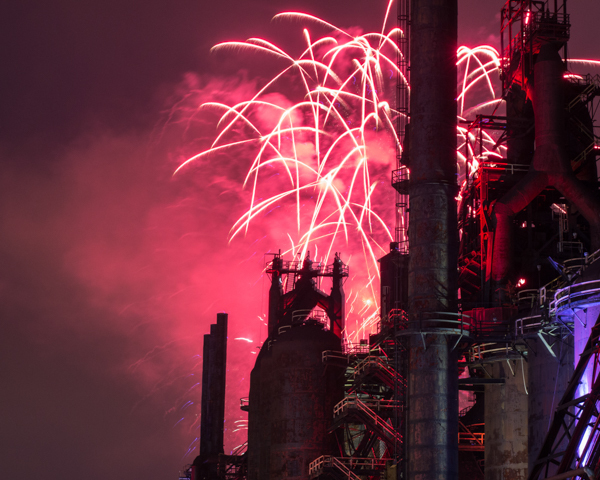 I’m selling prints of this beautiful scene from this year’s fireworks at the Steelstacks in an 8×10 size for $30. It’ll be printed locally here in the Lehigh Valley on matte paper and all the proceeds will go straight into purchasing replacement gear to keep the concert coverage and images on this site going. Even if you can’t purchase a print, please feel free to share this post with anyone who might be interested. The prints would make great early Christmas shopping. Thanks for listening and reading the site all of these years. I would love to purchase a print!